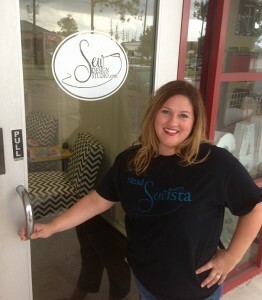 I am Yolanda, owner and teacher at Sew. I began my sewing career in the usual way, at my grandmother’s machine. As a child I was a Barbie fashion designer making outfits out of anything I could find no matter how sacred or sentimental they may have been. Many baby dresses and some of my mom’s outfits found their way into Barbie’s closet. As a teenager I learned alterations and repairs and sewed the occasional outfit. As an adult, I have sewn my way through clothes, accessories, costumes, curtains, slipcovers and gifts. I taught middle school English for 10 years and I always looked forward to breaks when I could get lost in sewing. I had pipe dreams of sewing for a living then suddenly idea for Sew emerged. In my last semester of teaching, I gave sewing classes to some of my students after school. The look on their faces as they turned their projects right side out was just the affirmation I needed. They felt confident, impressed with themselves and happy, and I want to spend my time helping others feel that way. I am over the moon about Sew, it is growing into a creative haven, a fun and inspiring space where people bring their ideas to life. Whether the project is quiet or involves making costumes and drinking champagne, everyone leaves with something they are proud of. Sew is a dream come true, and I am so grateful to my husband, our family and super-supportive friends for their encouragement and excitement. Sew offers something for every age and ability level. Beginners are always welcome.